Sole (like ole) cooks for the Illsley’s at Casa Las Chimeneas in Mairena. She was kind enough to let me watch her prepare some food for the guests. She made gazpacho, poor man’s potatoes and a fish dish. Here’s the gazpacho recipe. Put all ingredients in a tall container. Moisten the bread and break into chunks. Add enough water to cover. Add vinegars and olive oil. Salt liberally. Macerate with an immersion blender or put batches into a blender. Taste and adjust seasoning. 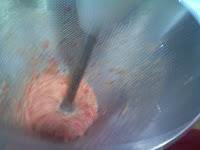 Put the mixture through a sieve and continue to push the immersion blender through. Taste again and adjust seasoning. Serve cold or room temperature. Garnish with croutons. Another Sole I met (she runs Aben Humeya restaurant in Valor) adds carrot and romain lettuce to her gazpacho.